Hydrogen Peroxide -- purchase at your local grocery or drug store. 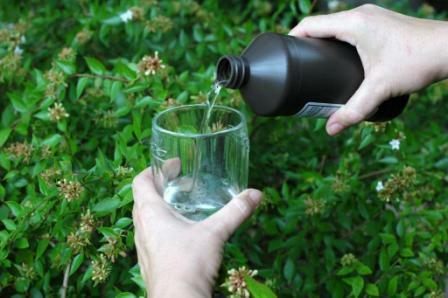 There’s a new use for hydrogen peroxide. The idea came up on one of my radio shows when I was asked how to control mosaic virus on squash. I knew that hydrogen peroxide would control bacterial diseases like erwinia and fire blight, but a hunch was that it might work on viral diseases too. The listener, an organic farmer, gave it a try and reported weeks later that it had completely cured the virus on his squash. What was the application rate? The 3% formula in the bottles at the grocery store is the rate tried at first and later by others. It seems to work well at that rate. It might work at an even lower rate. That needs to be tested. Here are some ratios: hydrogen peroxide mixing information. Horizon Distributing and Pool stores sell 27% hydrogen peroxide. It's very strong, so be careful when using it.